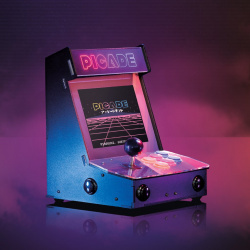 Power-up your TV with Picade Console! It's a compact, Raspberry Pi-powered retro games machine with authentic arcade controls that plugs right into your TV, monitor, or other HDMI display. Picade Console is more compact and easier to build, but has a bunch of new features liked a dedicated power button, better cable routing out the back of the console with a panel-mount micro-USB connector for power, and slick new artwork.